Before the semester starts, take some time to become acquainted with D2L features and tools that you'll be using on a regular basis. Online learning requires that you possess certain skills, behavior, study habits, computer equipment and discipline in order to be successful. Is there a course I can access prior to the semester start? Are there any videos I can view? Perform a system check before the semester begins. Become familiar with D2L system tools that you will use extensively throughout the semester. Links with detailed instructions are shown below. Community College and University students must login here. Students taking certificate/diploma programs through a Tennessee Collge of Applied Technology (TCAT) must login here. Students taking Continuing Education courses must login here. Verify that you have access to the course(s)you enrolled in through your home campus. 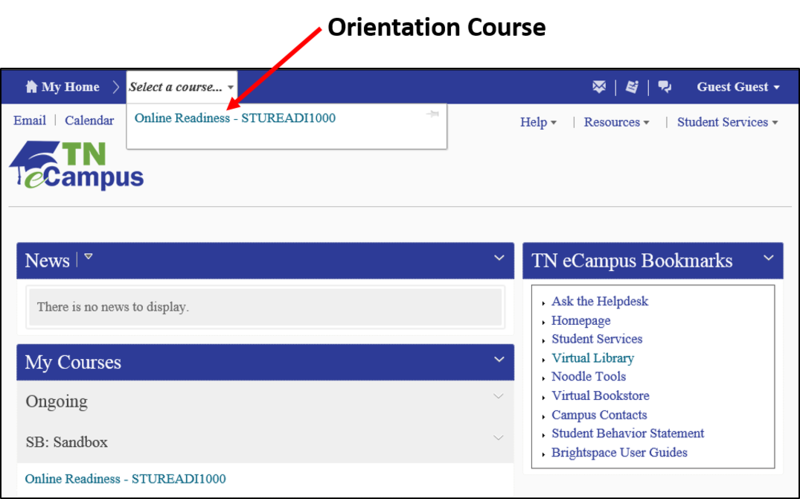 Contact the TN eCampus Help Desk with any technical issues that you encounter. Contact your Student Liaison for assistance with questions related to registration issues and procedures or your program of study. The Online Readiness course is all-inclusive course that covers everything from where to find course content to how best to communicate with your instructor. In essence, it provides you with a state of preparation and readiness that's needed to progress successfully through your online course.